Ambassador Bigot admits Israel is portrayed negatively in France, but says ”Haaretz” does the same thing. 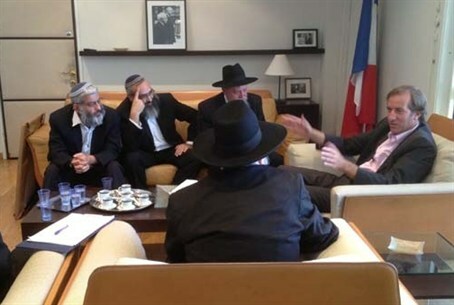 A prominent delegation of the Rabbinical Congress of Peace (RCP) representing over 350 leading rabbis in Israel met with Ambassador Bigot and urged him to use France’s influence to put an end to EU funding of anti-Israel and leftist groups in Israel. “These groups operate under the guise of peace and human rights but the money that the EU gives them is used for incitement against Israel, against co-existence and leads to bloodshed,” the rabbis said. The rabbis also warned that a Palestinian state in the region will be another Gaza, a hotbed for terrorism. When they discussed the Oslo accords, the ambassador said that "There were more failures than successes in the Oslo process." Rabbi Avrohom S. Lewin, Director of the RCP, told the ambassador that the RCP’s only consideration was the sanctity of life. “Will the territories-for-peace formula save lives or murder and maim lives? That is our only consideration in the Arab-Israel conflict. We request that you convey to the French government that unfortunately the past 40 years have proven that the 'land for peace' formula is a failure and only leads to bloodshed and instability in the region,” Rabbi Lewin said. Rabbi Joseph Gerlitzky, Chairman of the RCP, presented to the ambassador the Torah ruling signed by over 350 rabbis forbidding the concession of land currently under Israeli control, because it will not bring peace but will lead to war. “Today even a blind person can see that giving up territory does not lead to peace but to increased terror and loss of life. Only by following the word of the Torah which sees the sanctity of life as the highest value will a true peace be achieved, and therefore we request that the government of France declare that an Israeli withdrawal from Judea and Samaria will only lead to more terrorism and loss of life,” Rabbi Gerlitzky said. Rabbi Shlomo Rosenfeld, Rabbi of Shadmot in the Beit Shan valley, a son of a Holocaust survivor, said that although Israel has many friends, it cannot withdraw from any territory in Israel based on security guarantees by these friends. “France must understand that a strong Israel is not only good for Jews but for the Arabs who live here as well. Ironically, the Arabs living in the state of Israel enjoy freedom and co-existence while those Arabs who received autonomy and got back all of Gaza are constantly seeking Israel’s destruction. Is that what you want to happen in Judea and Samaria too?” Rabbi Rosenfeld asked. Rabbi Avrohom Y. Shreiber, a former rabbi of Gush Katif who currently serves as the Rabbi of Yad Netivot, described how life in Gush Katif blossomed for both Jews and Arabs before the Disengagement. “And now, what did we gain from the Disengagement? Destruction, terror and chaos. It turned into a hotbed for terrorism exactly as the Torah warned what would happen if you give up a border town." Rabbi Menachem M. Attal, the rabbi of the Jewish community in Tel Aviv expressed the sentiments of the Jewish French citizens in Israel against the French government's policies. Mr. Bigot promised to convey the rabbis' messages and rulings to the French government.